Thieleman J. van Braght was born to a cloth merchant and his wife in Dordrecht. As Thieleman grew, he took after his father and learned the commercial life. He traveled with his father when necessary to buy and sell cloth and learned much about how the world worked. Thieleman's childhood has an enormous impact on his future life and his father's influence should not be understated. One particular place of influence was Thieleman's life of faith and willingness to believe what he felt called to believe and not simply what he was told. Thieleman was given freedom by his family to explore his faith and how it impacted his life and the world around him. Having been set free to explore, he found a vibrant faith amidst the stories of Christians who had come and gone before him. For Thieleman, these stories kept him tethered to the Faith that he held in common with the subjects. As he traveled, he heard more and more stories. He developed a discerning ear and sharp memory for what he was told. Thieleman knew well the power of a story to inform our values. Hearing the stories of the early martyrs, Thieleman knew that his faith very well may cost him something personal. He found this message in so many of the stories he was told. As the stories had an impact on him, they became his stories and he shared them with others.Instead of simply telling people that faith should be important and something worth sacrificing for, Thieleman learned to tell the stories of those who valued the life of faith and laid down their lives for their convictions. This storytelling gift served him well when he became a pastor of a local Mennonite community in Dordrecht. Lovingly, he recalled the stories of his people and those who had gone on long before them to be hidden in God with Christ. He would reach into his satchel of stories, gingerly bring one out, blow the dust off, and unfold it before a crowd of hungry minds desperate for a story that explained life to them--for a story that really meant something. In this way, Thieleman was a caretaker of the Church's greatest artifacts and relics--its stories. 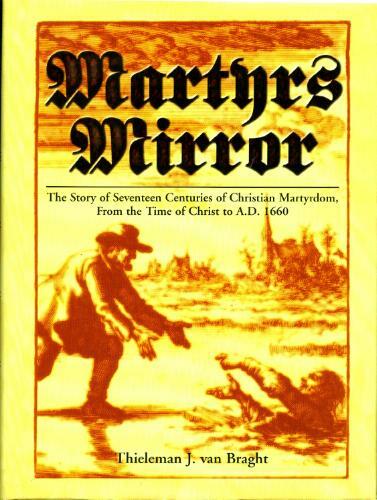 He condensed the stories into a collection that he entitled, The Bloody Theater or Martyrs Mirror of the Defenseless Christians who baptized only upon confession of faith, and who suffered and died for the testimony of Jesus, their Saviour, from the time of Christ to the year A.D. 1660. This is, most often, shortened to the Martyr's Mirror or The Bloody Theater. This collection of stories is a powerful testament to what it is that Christians like Thieleman and so many others hold dear. In many ways, if you want to know what somebody really believes all you need to know is what story resonates with them. When you find the story that a person uses to explain life, then you know where their values lie--you know what they worship and love. For Thieleman, it was the story of men and women willing to die rather than deny their faith. These were the stories he collected, told, and cherished.These were the stories that changed his life along with the lives of countless others who have come into intimate contact with the God who is love and promises life through death.